Lean Thinking: Japanese Words – To Use Them or Not? Japanese Words – To Use Them or Not? 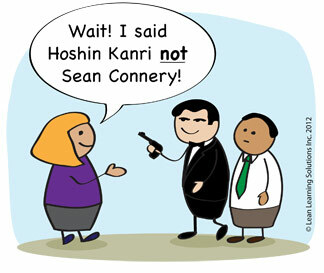 One of the questions I am often asked at clients is whether they have to use the Japanese terms associated with Lean. Most times the organization is leaning towards not using the Japanese terms and is looking to me for some kind of validation. I always answer that it’s their personal choice as an organization but there are several things to consider. The first is that Japanese terms don’t always translate well into English words. Japanese is a very visual language that relies on a character set called Kanji to make complete sentences in their writing system. Each Kanji or character represents a thought or image which is a very different structure from a Latin based language where each letter represents a sound. So translating these thoughts or images from Japanese into English can be difficult and produce some very wordy translations. Take Jidoka for example. It has various translations including; autonomation, machines with a human touch, built in quality at the source, separation of man and machine work. All of these translations are correct, yet none of them truly grasps the full meaning of the term Jidoka. Another reason I recommend using Japanese terms is in a Lean Transformation we are trying to change the culture of the organization. To change the culture we’ve got to get people behaving differently. Using Japanese terms signals a change and is a great antecedent to the change process. It tells people the status quo isn’t good enough and needs to be altered. It signals a different kind of change process from one where the change is sanitized to make it palatable to the entire organization and thus is watered down and limiting. I remember working with an organization who had decided not to use Japanese terms. I asked about “Kaizen” and they said they would use that one. I asked about “Kanban” and they said they would use that one as well. I asked about “Gemba” and of course, they said they would use that one as well, but they didn’t like “Muda” and were going to use “waste” instead. Fair enough. As I said, each organization has to develop their own glossary of improvement terms and needs to think deeply about what kind of culture change they are introducing by using those terms. For a sample glossary to get you started, please see www.leansystems.org. for a free download.